We have two important but easy-to-implement projects that can bring about great change in the community, on campus, and internationally. And we have events listed below! 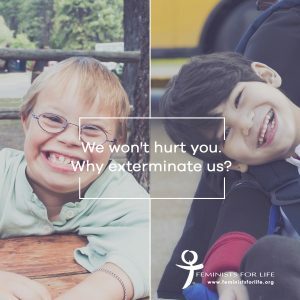 As we see the systematic elimination of those with Down syndrome, this Respect Life Month — and continuing into November. — we will be posting a series to bring about a new awareness in an effort to end their termination in developed countries. We ask you to share messages from those with Down syndrome and their families, especially if you have relationships with those in Iceland, Denmark, the U.K., France, and the U.S. These “developed” countries need to develop a new understanding, and they will hear from families with their own experiences. Join us with your comments on Facebook, and retweet our messages of hope or share them on Instagram. Equally important, please respect life by making life better for women, including women at risk of violence and those who have experienced pregnancy or infant loss. We are asking all pregnancy resource centers, domestic violence shelters, health providers, places of worship, legal aid offices, campus leaders, and administrators to share our new resource for women. 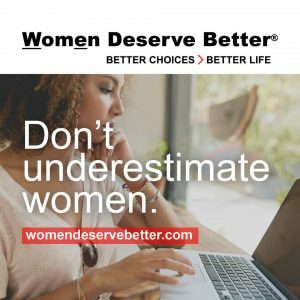 WomenDeserveBetter.com and our new Facebook page help answer the needs of women at highest risk of abortion including mothers (yes, mothers), the poor and financially challenged, students, and working moms. We have memes to share on social media and downloadable ads. So please share this resource with resource providers! We are also on Instagram! If you, family, and/or friends are in New York, Virginia, or Washington, D.C., please mark your calendar with the following events! Please come to upcoming lectures at Saint Mary’s Church on Long Island or George Mason University in northern Virginia. See below for details. Thank you for supporting our efforts on campus, including our 22nd Annual Pregnancy Resource Forum at Georgetown University! PS: Volunteers and interns needed for online research and basic tech jobs. Please contact info@feministsforlife.org with a cover letter explaining why you are a feminist and pro-life and what skills you offer. Also attach your résumé. Thank you!